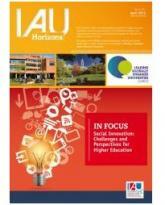 Focusing on the theme of the IAU Global Meeting of Associations 6, this issue offers a variety of papers on why and how higher education fosters social innovation. Universities are institutions intimately linked with society and the challenges society faces, and consequently, they carry on themselves the responsibility to become an active actor in the response to these challenges. Institutions of Higher Education need to position themselves as a platform for social innovation and address the problems we need to confront today.